Save Tchaikovsky’s brilliant original score there was little choreographer Mario Radacovsky’s psychological ballet Black Swan White Swan had in common with traditional productions of Swan Lake. No feather-adorned tutus, no clack of pointe shoes hitting the stage floor and no love story of prince and a beautiful swan that transcends death. His contemporary version of the Marius Petipa classic instead had its dancers in modern-day costume, often barefoot, and told the story of a self-absorbed man who, faced with his own mortality, sought refuge in romantic relationships with two very different women only to be tormented by feelings of guilt and betrayal over his infidelities with them. 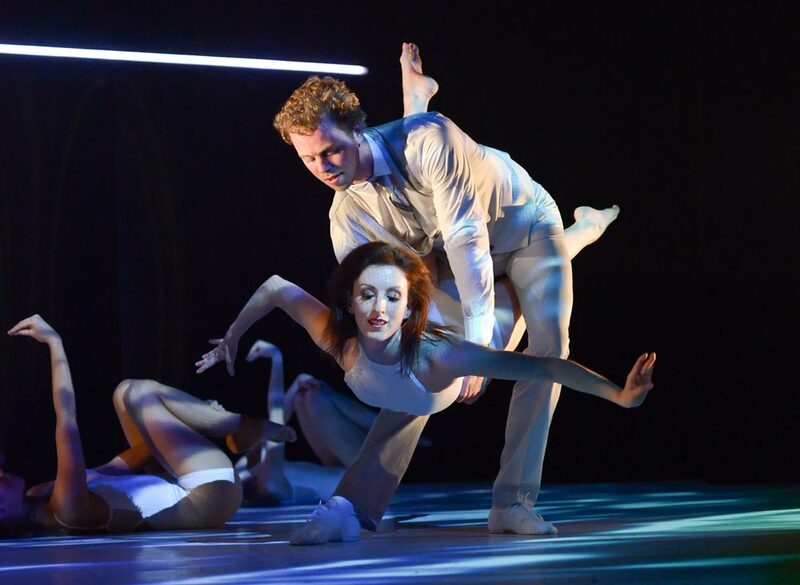 The world premiere of the black-and-white themed two-act ballet by Grand Rapids Ballet Company (GRBC) at the Peter Martin Wege Theatre began with a darkened stage on which the moving image of the surface of a shimmering lake was projected. The lake’s waters gradually became more turbulent as apparition-like circles of white light rose from its depths. The mesmerizing scene then shifted to two others that served as setup for the ballet’s storyline and where we were introduced to its main characters. In the first, a brief encounter between Nicholas Schultz as Siegfried and Laura McQueen Schultz as the White Swan (she looking more like a secretary than a swan) left the impression that Siegfried was in poor health as he collapsed to the floor (repeating the gesture at intervals throughout the first act) and that whatever ailed him, as well as his inner demons, were being manifested in the form of the sorcerer, Von Rothbart. Dancer Kyohei Giovanni Yoshida was riveting in his portrayal of the clingy, jealous and sinister Von Rothbart who seemed to have an equal measure of aggression and desire for Siegfried. His dancing was a potent blend of skill and power. The second found Siegfried at a dance party where he encountered Black Swan, Dawnell Dryja. Radacovsky’s contemporary dance choreography for the scene had its five couples rocking back and forth in each other’s arms in a slow dance then picking up the pace to a comedic level while the Black Swan fawned over a now-melancholy Siegfried while Von Rothbart inserted himself between the pair, grabbing at Siegfried or climbing onto his back. Apart from the ballet’s leads, GRBC’s dancers appeared at times uneasy in Radacovsky’s gesture-laden contemporary movement language; their dancing lacked energy and crispness. Toward the end of the first act however, the ballet and the dancers’ performances seemed to come into their own thanks to a striking dreamlike scene where a corps of fourteen swans, barefoot and in white leotards, performed choreography that blended references to Petipa’s production with twisty, off-balance movement. 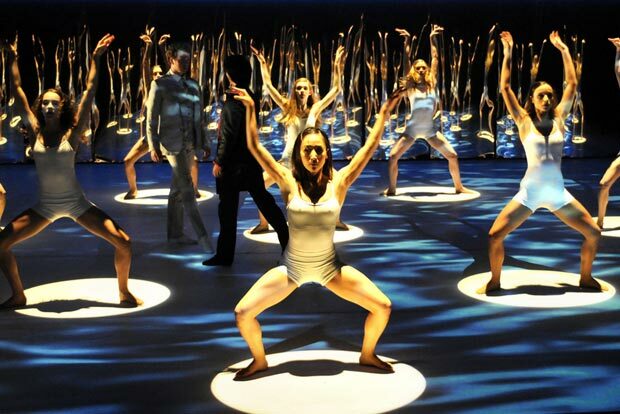 The swans each danced in individual spotlights atop the shimmering lake projection that harked back to the ballet’s beginning and brought home the notion that the swans were in fact the apparition-like lights that rose from the lake’s depths. Backed by a wall of mirrored panels that multiplied the number of Swans, Siegfried and Von Rothbart slowly stalked each other as the swans danced, creating a marvelous juxtaposition of growing tension and animated beauty. A lightning-quick dance of the four cygnets and a playful and acrobatic pas de deux between Siegfried and the White Swan followed to end the act. McQueen Schultz as the White Swan was radiant and her performance in the pas deft. The ballet’s second act saw Radacovsky’s choreography abandon its sometimes cutesy elements in favor of rich, emotional and more technically challenging movement. It opened with Siegfried and Von Rothbart in another battle of wills in which both dancers shone. The ballet then climaxed in the Black Swan pas de deux where a seductive and fierce Dryja partnered by Schultz wowed the audience. Darting legs, sharp turns and daring lifts were thoroughly enthralling. The rest of the ballet saw Siegfried seemingly defeat Von Rothbart only to have him return when the White and Black Swans met each other and exposed Siegfried’s infidelities. The ballet ended with Siegfried and Von Rothbart lying lifeless on the stage as the projected image of a swan in flight surrounded them and GRBC’s swan corps slowly flapped their arms to Tchaikovsky’s stirring music. Perhaps not a production for the ballet purist and in some ways a flawed one, Radacovsky’s ballet was nonetheless a triumph. For GRBC, now in its 40th season and the second under new artistic director and former Pacific Northwest Ballet prima ballerina, Patricia Barker, Black Swan White Swan was bold and successful step in the new direction Barker is taking the company from a little-known regional ballet company to one in the national spotlight. A former dancer turned writer/critic living in the United States, Steve studied ballet and modern dance in Erie, Pennsylvania and at Pennsylvania State University. He has performed in numerous contemporary and classical works sharing the stage with noted dancers Robert LaFosse, Antonia Franceschi, Stacy Caddell, Joseph Duell, Robert Wallace, Sandra Brown, and Mikhail Baryshnikov. His writing credits include articles and reviews on dance and the arts for The Plain Dealer (Cleveland, OH), The Buffalo News (Buffalo, NY), Erie Times-News (Erie, PA), City Paper (Pittsburgh, PA) as well as Dance Magazine, Dancer, Dance Studio Life, Pointe, Stage Directions, Dance Retailer News, Exploredance.com, Balletco and DanceTabs. Steve is also chairman emeritus of the Dance Critics Association; an international association of dance journalists.